Is only 1/3 of your message “Sticking” with your audience? 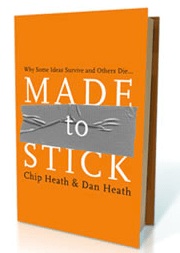 I just finished reading Made to Stick, why some ideas survive and others die, by Chip & Dan Heath. A good friend of mine, Greg Herder of Hobbs Herder Marketing recommended this book at one of his marketing seminars. The 6 Principles of Sticky Ideas are remembered by and acronym SUCCESs and are covered in less than 300 pages. We’ve now applied these principles to our Training Classes, Business Meetings, and our office’s day to day conversation. We all have ideas we need to communicate, and if they contain a few of these principles, your chances of them sticking to your audience will increase significantly.